It’s time for comfort food around our house and this surely qualifies. Part of what makes a ‘comfort food’ is childhood memories of it. I’ve mainly served my children healthy food so I hope their future comfort foods may be fairly healthy items. I don’t know whether my own family ever had the classic beef stroganoff (Mom?) but I certainly cooked Mollie Katzen’s Vegetable Stroganoff from the original Moosewood Cookbook when I was in college, and this recipe in its inspiration and spicing still owes something to hers. Another part of comfort food is that it’s rich and filling, and this recipe certainly is that. It’s pretty high-fat, with more of the fat coming from extra virgin olive oil than from anything else. For something lighter you could steam the tempeh instead of frying it, or pre-steam it before frying so it will absorb less oil. I used some of my own homemade vegetable stock from the freezer for this recipe and it added a lot of flavor. My teen hates mushrooms so I rarely serve them. In service to getting my comfort food, though, I made this with an ample amount of criminis, which are small portobello mushrooms. I made a second, teen-friendly version, just as good, with a head of cauliflower substituting for the mushrooms. And a third (un-pictured) version where I served the stroganoff over brown sushi rice to make it whole-grain and gluten-free. Personal chef service at work! 1 lb. soy tempeh (2 8 oz. packages) sliced into long, thin, strips ¼" wide. Simmer one cup of vegetable stock until reduced by half. 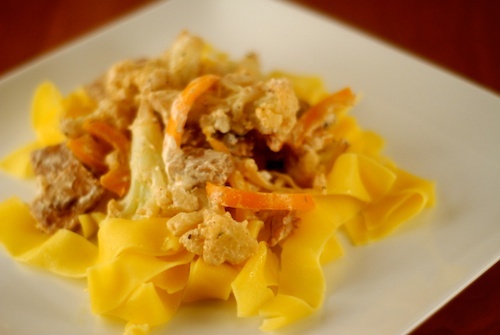 Fry the tempeh in olive oil over medium-low heat. I do this in 2 batches with 8 oz. of tempeh and 3-4 Tbsp. olive oil in each batch, flipping the tempeh after a few minutes. 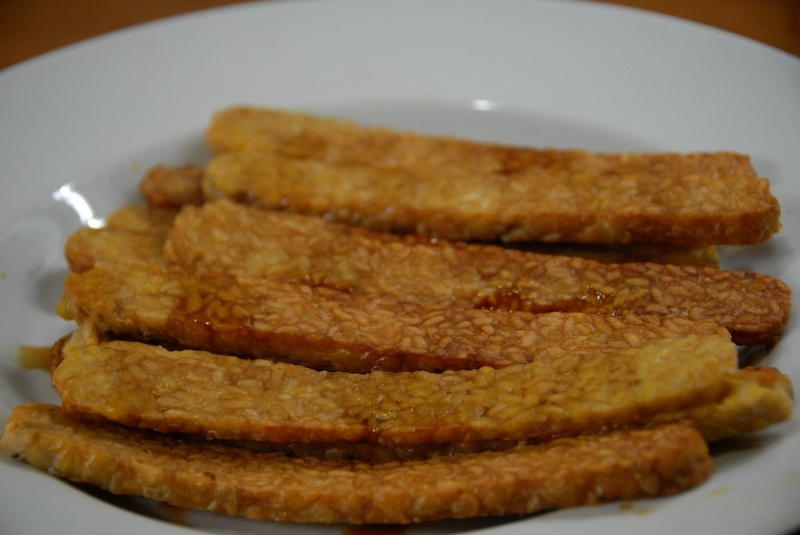 For more detailed directions please see my post on "Fried Tempeh." 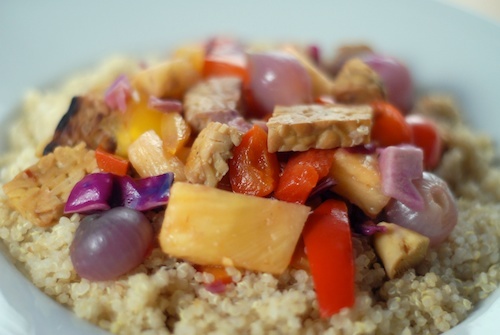 Remove tempeh from pan and reserve for later in recipe. Cut it into short pieces. Melt the ghee or butter (ghee will make it easier to avoid scorching) on medium heat. Add crimini mushrooms and chopped shallot, saute, stirring occasionally, for about five minutes. Add garlic and bell pepper, lower heat a little, and cook for another 2-3 minutes. By now the mushrooms should have darkened, softened, and absorbed the butter and shallots should be cooked through. Add wine, vegetable stock, tamari, and fried tempeh to the mushroom/shallot mixture. Cook mushroom/shalllot/tempeh mixture for several more minutes. Turn off heat and wait a minute, this will let the pan cool off a little so it will not break the sour cream when you add it. Add sour cream, spices, and salt and pepper to taste. Stir together. 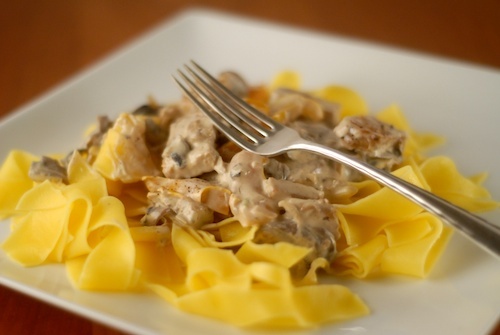 Serve pasta with stroganoff sauce on top. 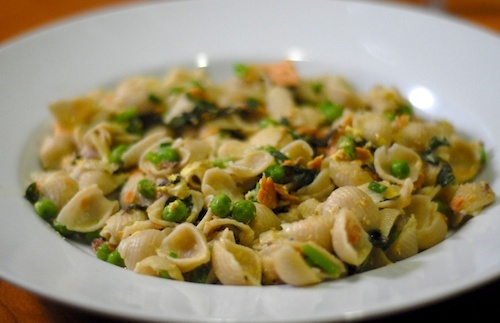 Smoked Salmon Pasta Carbonara A lighter, non-dairy pasta carbonara with smoked salmon instead of bacon. Tempeh Sloppy Joes Fast, cheap, healthy, and liked by my kids-- tempeh Sloppy Joes were a real staple for me when I had young children. 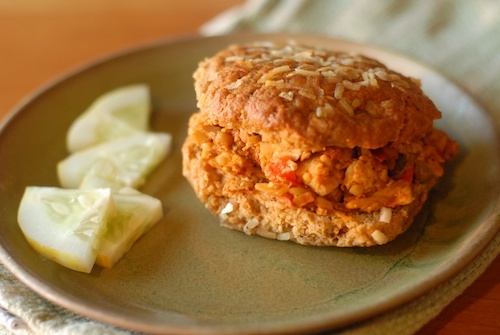 Here's how to make them with tempeh, an onion, a red pepper, and tomato sauce. Comfort food! It IS all about memories and what we believe soothing for the soul. I don’t use tempeh enough and this is a reminder to me. I really need to branch out a bit 🙂 Thanks!